This entry was posted in Event, News, Town on July 2, 2017 by Walter Niebling. Barnegat Township’s concert and fireworks starts at 7 p.m. at the Municipal Dock on July 1. Rain date is set for July 5. Beach Haven will have fireworks at dusk along 9th and Bay Avenue in Bay Village. Beachwood’s fireworks will start at 9 p.m. at the beachfront July 4. Brick Township’s Summerfest 2017 Concert featuring Rubix Kube will be July 6 from 6-10 p.m. at Windward Beach. The fireworks will follow the concert at 9 p.m.
Lakehurst will have fireworks July 3 along Lake Horizon at dusk. 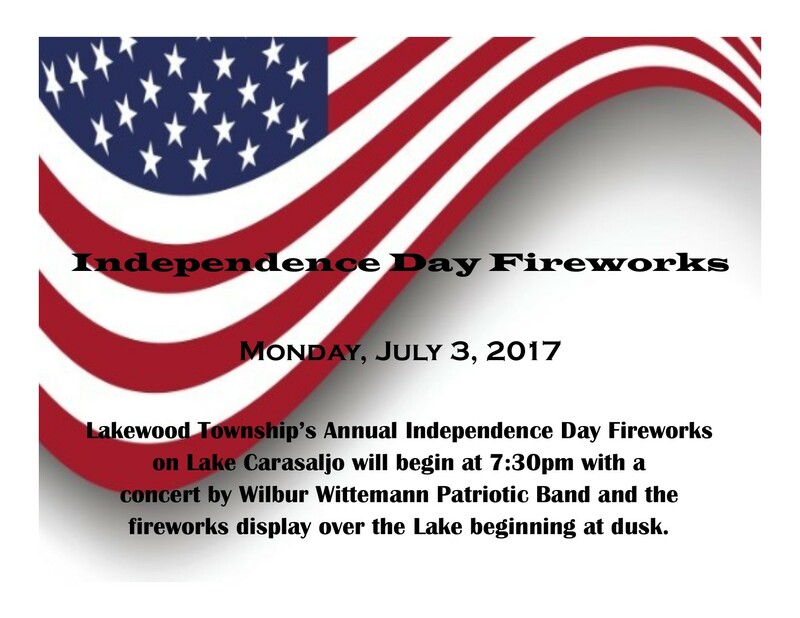 A parade will follow on the 4th of July on Union Ave starting at 11 a.m.
Lakewood’s Independence Day Celebration will have a fireworks show July 3 on Lake Carasaljo starting at 7:30 p.m. The fireworks will begin at dusk. The Lavallette Independence Day Extravaganza Fireworks and Concert starts at 8 p.m. at the gazebo on July 2. The fireworks will start at 9 p.m. Rain date is July 9. Manchester will celebrate Manchester Day on June 24 starting at 2 p.m. at Harry Wright Lake with fireworks at dusk. Pine Beach’s Fourth of July parade will be on July 4 starting 9 a.m. at Pine Beach Chapel. Jenkinson’s Boardwalk in Point Pleasant Beach will have a fireworks show on July 4 at 9 p.m.
Seaside Heights will have fireworks at The Classic American Boardwalk starting at 9:30 p.m. on July 4. Rain date of July 7. Six Flags Great Adventure in Jackson will have its July 4th fest from July 1-4. Fireworks start each night at 10 p.m. along the lakefront. Tuckerton’s celebration starts with a parade at 10am along Route 9 and the Seaport. Fireworks will begin at dusk. This entry was posted in Event, News, Town on June 29, 2017 by Walter Niebling. This entry was posted in Event, News, Town on June 16, 2017 by Walter Niebling.